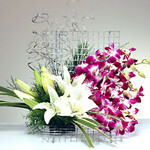 Flowers Boutique > Exotic Flowers - II. Item Description Combinations of white lilies and pink orchids to cheer you up. Please order atleast 2 days in advance. 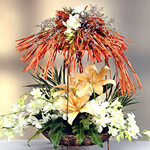 Item Description A canopy of raffia finishes this beautiful arrangement of peach lilies and white orchids. Please order atleast 2 days in advance. 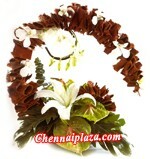 Item Description Chocolate Anthuriums and vanda orchids beautifully arranged on an wooden platter that's sure to amaze the recipient. Please order atleast 2 days in advance. 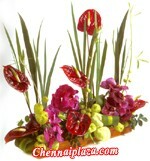 Item Description A soothing arrangement of white orchids and oriental lilly with a splash of green anthuriums. Please order atleast 2 days in advance.